Posted on August 21, 2015 at 6:48 pm. In the last several weeks we have had some low 50 degree temperatures at night in North East Ohio. With that comes sizing of material, which we have started. Most of the evergreens are in the availability now and we will be starting the deciduous material very soon. This means the material is just about finished growing, making it a great time to schedule a tour of the nursery. We would love the opportunity to show you our Unique and Specimen Nursery Stock to you! Posted on April 2, 2015 at 7:17 pm. We began expanding our container area in the fall across the street from the main office. We have included more Branded material to have the plants that your customers are reading about in the horticulture and home improvement publications. We will also be potting more of our field grown shrubs that were grown for containers such as Hydrangea quercifolia cvs for 5 and 10 gallon cans. Posted on April 2, 2015 at 7:14 pm. 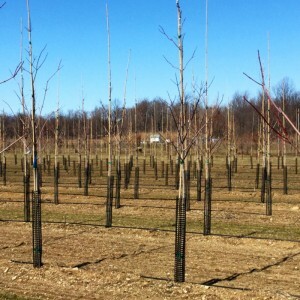 We have increased planting of trees for the last few years and we will have considerably more 2” material available to meet customer demand in fall 2015 and spring 2016. This includes more cultivars of flowering and shade trees.